This quick, easy recipe for pulled pork sliders will keep you out of the kitchen and at the party with your guests. The garlic spinach topping adds a hearty flavor to the mellow pork. Lightly coat a shallow skillet with nonstick cooking spray. Sear pork loin in skillet over medium-high heat, turning to brown all sides. Transfer to baking pan and cover with foil. Bake for 20 minutes, or until a meat thermometer inserted in the center registers 145°. As an alternative to baking in the oven, the pork loin can be cooked in a slow-cooker, on high, for 4 hours. Allow pork loin to cool for 5 to 10 minutes. Using 2 forks, shred pork completely. In a large bowl, toss pork with BBQ sauce, coating evenly. In a large skillet, heat oil over medium-high heat until hot. Add garlic and sauté until fragrant. Add spinach and sauté for 3 to 5 minutes, or until spinach is wilted. 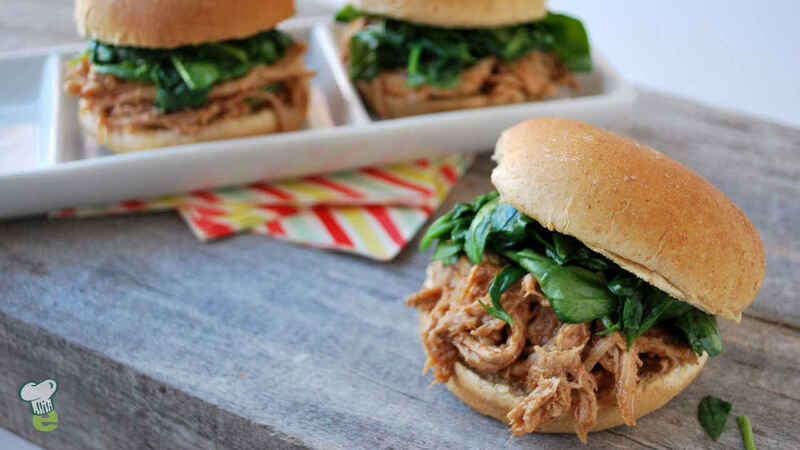 Transfer pulled pork to buns and top with spinach. Serve hot.